I was looking forward to an interesting experiment this year, because weather conditions were similar to 2017, except for a hotter run. 2017 had wind on the bike for some people but I missed that (wind only picked up once I was done on the bike). But my training was vastly different in 2018 vs 2017, so the goal was to have some quantitative data showing how much difference it would make going “all in” vs “minimal”. In 2017 I had a minimal approach to training: no swimming until 3 weeks before, and total training averaged about 13-15 hours per week in final build. In 2018, I averaged 20 hours per week in final build. I swam a lot, was in best swim shape ever, and also in best bike shape ever. Run was pretty decent too, although I was sidelined with an injury for 10 days about 4 weeks out from race day. Race morning was better logistically in 2018. I stayed at the Westin which is right there within walking distance of T1. In 2017 I had a 10 min drive, which was not really a hassle at all, and a lot cheaper. 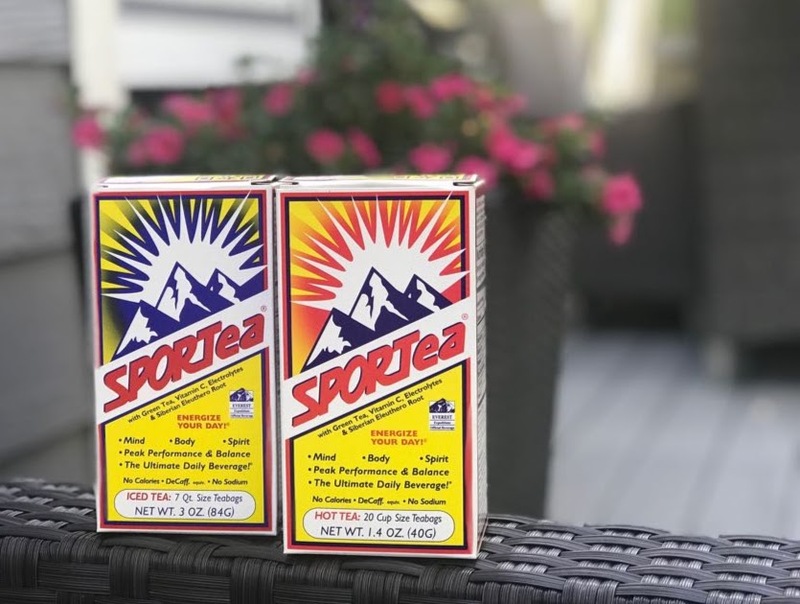 Breakfast was similar, bagel with almond butter, but this year I also added Sportea, a really amazing tea that I happened to discover purely by accident. Now, it’s a training and racing staple. I’ve reached out to them and they’ve offered a discount code for first time buyers to try it out. You can find out more on my gear page. After eating and drinking, I walked over to T1 to finalize my bike setup and nutrition. 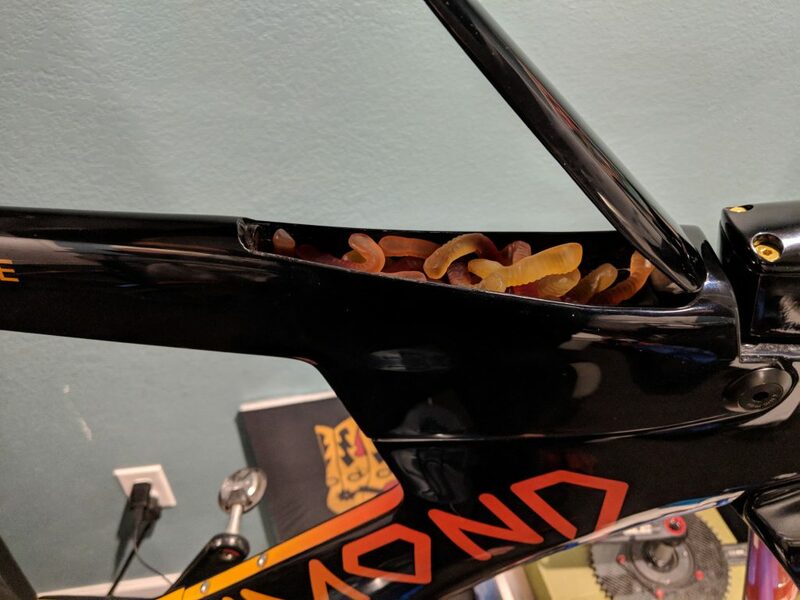 Tires (Conti Supersonics) pumped to 95PSI, nutrition was iced Sportea in the XLAB Torpedo between the bars, my maltodextrin/fructose/gingerbeer blend in an aero bottle on the downtube, and gummy worms in the bento box. It’s a long walk over to the swim start, and similar to 2017 I arrived with less time than I would have liked. I got close to the front of the self-seeded rolling start, maybe 6 rows back. This was a wetsuit swim (vs non-wetsuit in 2017), which makes the comparison a bit difficult, although my wetsuit and non-wetsuit times are very close (within a minute). There was a bit of commotion at the start, but I quickly settled in and swam alone the whole way. With about 500m to go, I saw one of my coached athletes, George, about 2m away from me. Being the terrible coach that I am, I sprinted him for the line finishing about 8 seconds ahead. I can’t let those athletes get complacent! Swim comparison – 1:05 in 2017 (non wetsuit), 57 min in 2018 (wetsuit), but as I said my wetsuit times are traditionally not much faster than my non-wetsuit times. So conclusion #1 – swim training does actually pay off! I got on the bike and felt great. I didn’t see my swim time at the exit, but I saw that the time of day was exactly 1 hour after the gun went off, so I knew that I’d had a decent swim to be out and through T1 in 60 mins. My power was great – I was riding about 280w and it felt pretty easy. I slowly made my way through the field – at that point the peletons had not yet formed – so it was plain sailing for at least the first 30 mins. I don’t know where I got this image – if you are the photographer please let me know and I can give you credit! Just before the toll road, I came up to a Latin-American group. I say Latin-American because the group was made up entirely of riders from Colombia, Argentina and Brazil (they had names and flags on their kit). There were about 15 of them in a very tight paceline. I put in a big surge to get past all 15 of them in one go, but they managed to stick to my wheel for a few minutes. Finally, I implemented a few 600w microbursts that Matt Bottrill has me doing in training, and I managed to drop them. After that, there was just a small group ahead that seemed to be riding legally. I rode up to them and went onto the front so that I could ride my pace. It was now about an hour into the race, and I was super happy with my average power, which was sitting at 265w (a bit higher than planned due to the dropping of the Colombians). About 3 minutes into my turn on the front and I heard the dreaded thump of a flat tire. I’ve been prone to “ghost flats” (where you imagine a flat tire but it’s fine), so at first I thought (hoped) I was imagining it, but I looked down and it was as flat as a pancake… dammit. I pulled over and tried to just inflate the tire again (since I had sealant in the tubes already). However that didn’t work at all, so I ended up changing the whole thing. It took a lot longer than I would have liked, but I wanted to be extra careful since I only had one CO2 cartridge left. Before the flat, I was really close to the front of the field, and ahead of Sam Gyde and Dan Stubleski, who I hoped would catch up to me and then we could ride together. However they both passed me while I was fixing the flat on the side of the road. A few peletons passed me too, and I knew then that it would be a hard task to get back and pass them. With the flat tire now fixed, I got back on the bike and eased back into the race. After a few minutes I found my first group of maybe 20 riders. They could have actually ridden legally and helped each other a lot if they just hadn’t been riding like idiots. Basically, they would all ride past me and then sit up, forcing me to slow down. Then they would accelerate again as I tried to pass them. We concertina’d like this for about 15 minutes, until I got tired of riding like that and just put in some big efforts to get past them all. I rode away from them, and didn’t see them again for the rest of the day. I was pretty annoyed at this point, not so much because of the drafting, but because my 2018 vs 2017 experiment was getting off track with all these spiky efforts I was putting in. In retrospect, I probably could’ve just sat 12 meters off the back of one of these groups and ridden it in at about 180w (that’s literally what my power was sitting behind them, vs 265-280 being in the front, with surges to 360w to get past). For the final 10 miles I was completely alone, with the exception of passing Caroline Gregory quite close to T2. Bike comparison – 4:30 in 2017 on 240w NP, 4:32 in 2018 on 240w NP. However I got a flat tire that sidelined me for 10 mins which messes it up a bit. 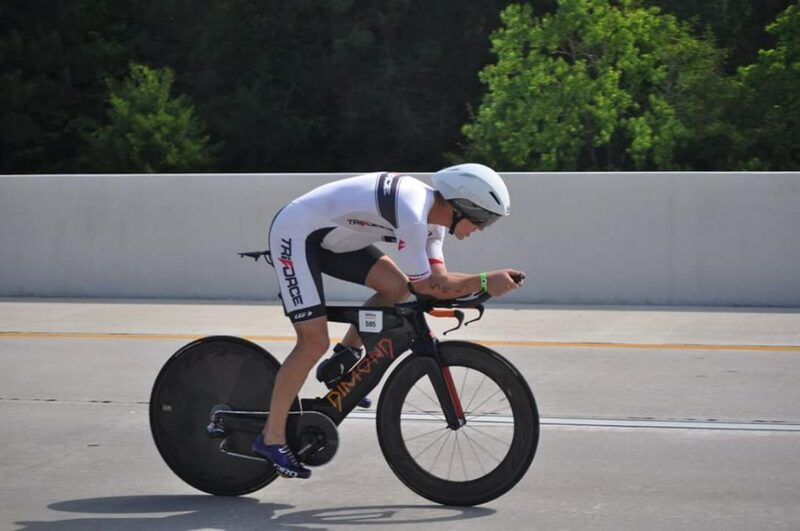 Before the flat, I was on track for around 4:16… I was at 265w NP in the beginning, and my initial splits were a bit faster than Sam Gyde who ended up riding 4:18 this year. Once I got back on after the flat, I was of course surrounded by all the peletons which made it hard to put out even power. I was easing off to stay legal, and then hammering past the pace lines to get back onto my own pace again. But take the flat out and I would have come in on 4:22. I am on a smaller Dimond this year with a much more optimized position, which I think played a role too. Run plan was to hit 7:15 pace (in training I was hitting 6:50s pretty easily) and slide in under 3:10. I was bang on 7:15 for the first 10 miles and then I just slowed to 7:45 pace for the next 10, I was not really able to do much about it. I believe the cause of my run fatigue was the spiky nature of the bike ride. It literally went from feeling super easy 7:10 pace at mile 9, to super hard 7:40 at mile 10. As I was getting close to the end of the run, I saw that if I pushed it a bit I would go under 9 hours. I had to dig really deep, but I timed it perfectly coming in at 8:59:24 – 36 seconds to spare! Run comparison – even with the fatigue on the run, I was 8 mins faster than 2017. Conclusion: high training volume definitely helps, but in the end I was only 13 mins faster in 2018 vs 2017. Perhaps you could add another 10 mins because of the flat. I think 23 mins is definitely worth the extra work, 13 mins might be depending on what your goals are. The faster your overall time, the more difference 13 mins will make. Personally, for me it’s worth it. If you consider what I thought I was capable of on the run, there is even more time on the table. But in that particular example, I prefer to use reality vs what I thought I could have done. I’m fortunate enough to have set up my life in such a way that I’m able to train a lot without it affecting family life etc. but if you’re someone that is sacrificing a lot personally, just to get in 20+ hours per week, you could probably still do pretty well on much lower volume and with a focus on quality. This entry was posted in Race Reports by Rob Gray. Bookmark the permalink.